Hey, Dr. Aaron Collins here with a personal message about our end-of-life wishes. You may know that the staff here at Collins Chiropractic loves nothing more than to share great information that can be both life-changing now and during a period when your health is suffering or declining. We do this through our free Wellness Orientations in our office each Wednesday at 5pm and we also go out into our community to speak with groups and hold workshops. Recently, I was out at a community event talking about the benefits of preventive, holistic-based health care and that it’s better not to wait until you’re sick or injured to start incorporating healthy habits into your life. I’ve given this talk many times and have enjoyed each one but, on this particular day, toward the end of my speaking time, I was hit with an epiphany. It came to me in a flood of thoughts and emotions that put a completely new perspective on why I’m so passionate about what I do. 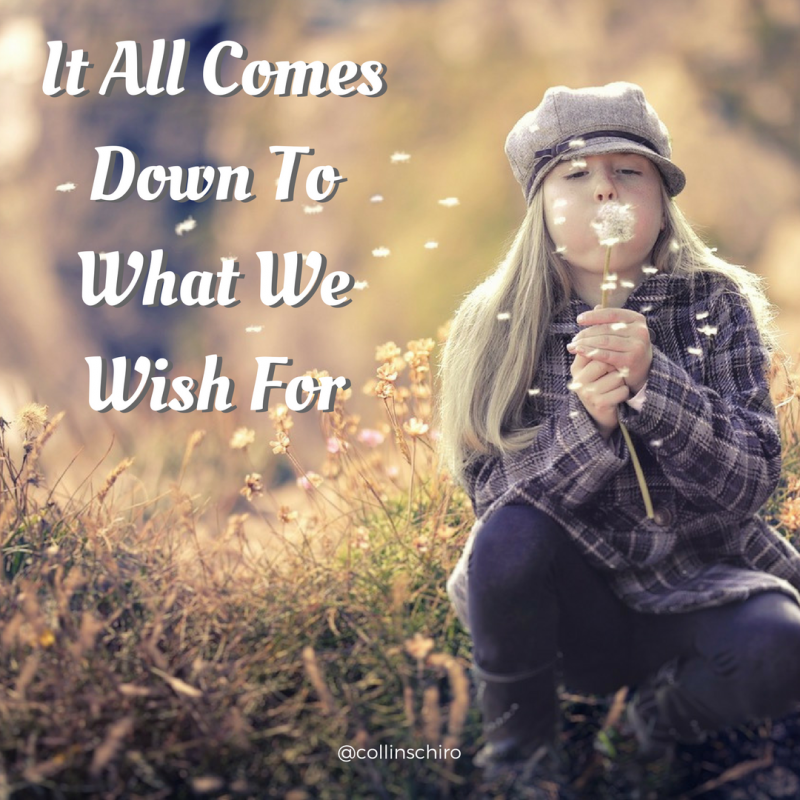 Especially when we are facing a health crisis, we do a lot of thinking about what we wish for, either for the present time in our lives or for our future. You may even have heard someone nearing the end of their life say all of the things they wish they would have done differently. We know that things like “I wish I would have worked more” or “I wish I would have had a nicer car when I was younger” are rarely, if ever, at the forefront of these wishes. When we’re wishing, we wish for the things that truly matter to us — happiness, family, peace of mind, good health…the list goes on. And this is when it hit me. When we have our health, we have so many more “wishes” available to us. When our health is poor and that has affected our energy levels, limited our mobility, put us in pain, and made us stop doing the things we love to do, our wishes become very limited. We’ll start dwelling on thoughts like “If only I felt better, I would…” and “I wish I would have taken better care of myself.” Rather than wishing, we begin regretting. As we grow older, our hopes and dreams may include traveling more, spending time with our children and grandchildren, going fishing or camping, volunteering at something we’re passionate about, taking yoga… whatever we didn’t always have the time to do when life was about working and raising a family. I don’t want you to run out of the opportunity to have more wishes and to be able to actively pursue each one until that wish comes true! And that is why I do what I do — not just provide great natural health care treatments but to educate everyone who I meet that if you live healthy now, your options for your dreams and wishes will stay wide open for a very long time. I hope you will take the opportunity to attend one of our free Wellness Orientations or attend one of our community events. Just call our office to schedule — you don’t even need to be one of our patients and there’s no obligation to work further with us. This is just part of what we do to make the world a healthier place. Investing in yourself and taking action now will help you avoid health crisis-management later so that you can keep your wishes alive. Come see us — we would love to get to know you better and hear just what you’re wishing for.